South Korea carries out a show-of-force after North Korea’s latest nuclear test. On Monday, South Korea’s military confirmed that it carried out a combined live-fire exercise as a show of force in response to North Korea’s claimed test of a thermonuclear bomb on Sunday. According to South Korea’s Yonhap news agency, the drill involved South Korea’s Hyunmoo precision-strike short-range ballistic missiles and F-15K Slam Eagle fighter jets. “In the drill, the Hyunmoo surface-to-surface missile and the F-15K’s long-range air-to-ground missile accurately hit designated targets in the East Sea,” Yonhap noted, citing South Korea’s Joint Chiefs of Staff. The exercise on Monday was designed to simulate a strike by South Korean force on North Korea’s nuclear testing site at Punggye-ri by firing missiles at a similar trajectory into the Sea of Japan. The site mostly comprises mountains in the country’s North Hamgyong Province. It’s unclear that South Korea would target Punggye-ri either during wartime or in a preemptive strike given that the site only bears utility for nuclear testing. It does not host any major North Korean military facilities or command and control nodes. The Hyunmoo firing would be the second in a matter of weeks. 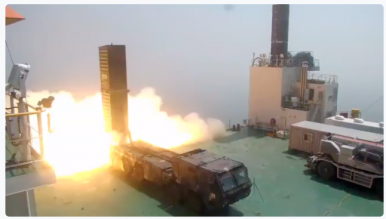 South Korea test-fired three Hyunmoo-II extended-range variant missiles—likely the block IIB and IIC—between August 24 and 26. That launch was immediately succeeded by North Korea’s own launch of three short-range ballistic missiles. South Korean President Moon Jae-in additionally chaired an emergency meeting of the country’s National Security Council after it became clear that North Korea had carried out its sixth nuclear test on Sunday. A day after North Korea’s nuclear test, it additionally remained unclear if U.S. President Donald J. Trump and his South Korean counterpart had spoken by phone. Trump had spoken to Japanese Prime Minister Shinzo Abe earlier and U.S. Defense Secretary Jim Mattis had reiterated the United States’ “ironclad” commitment to both South Korea and Japan in a statement. There's something familiar about the inter-Korean Pyongyang Declaration.